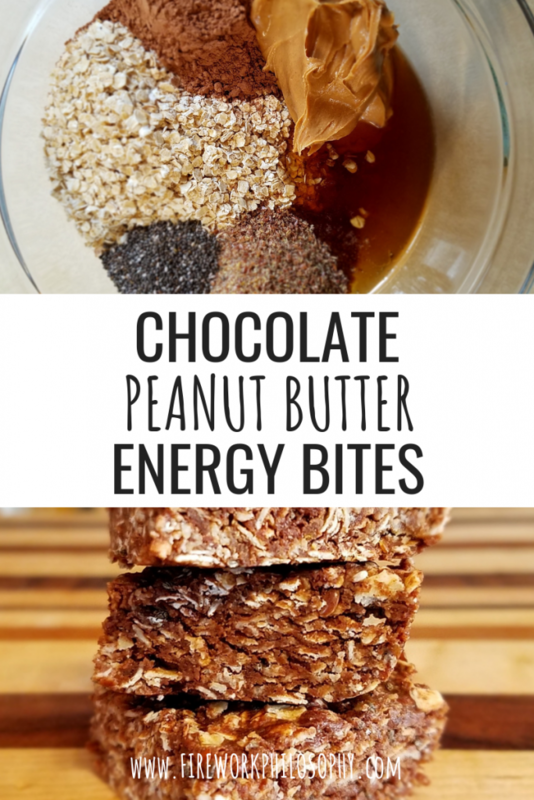 These Chocolate Peanut Butter Energy Bites are the perfect snack to have on hand at work when you’re craving sweets but don’t want to resort to junk food. I’ve had this recipe in my arsenal for some time now and lately, I’ve been making them much more often since they’re so great to have on hand and they last for a little over a week in the fridge. 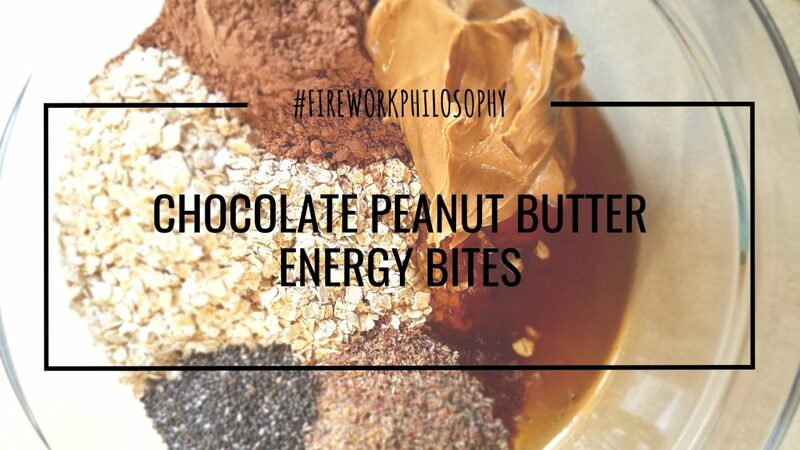 These energy bites are PACKED with protein and fiber from the oats, peanut butter, cocoa powder, ground flax and chia seeds. Plus, they’re sweetened with honey which make them a great option if you’re cutting back on processed sugar. I pack them into a 6×8″ Anchor food storage container like the one included in this set, let them chill and then cut them into snack-sized pieces. You can use any kind of smaller, glass container or you could use a small cookie dough scoop and roll them into round energy bites but I’ve found packing them into a glass dish and cutting them into pieces is less messy and less time consuming. Two of these little energy bites mid-morning or mid-afternoon are enough to get me through until lunch or until dinnertime. These treats are too “healthy” for The Farmer to consider snacking on but Little E loves them too so I’ll officially declare them kid-friendly too! 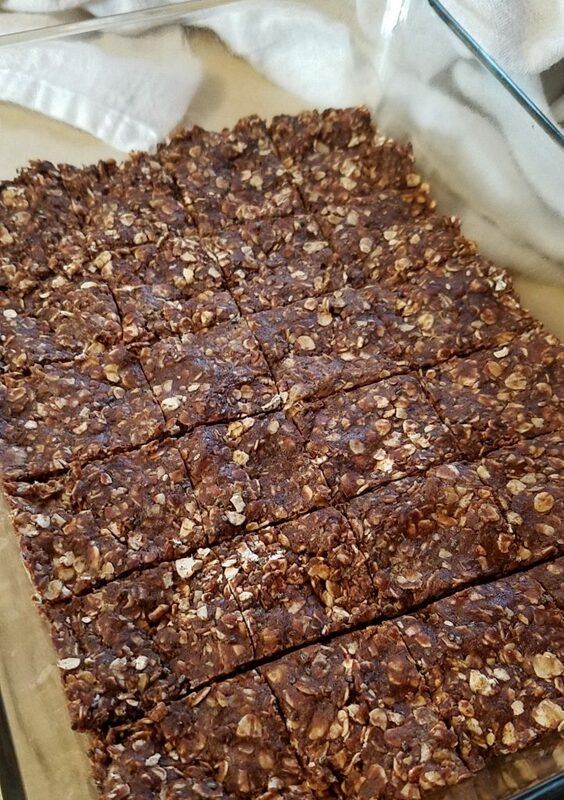 These simple to make, seven ingredient energy bites make for a great mid-morning or mid-afternoon snack. Add all ingredients to a large mixing bowl and stir until well combined. Press firmly into a small glass pan and refrigerate for at least 20 minutes before cutting into snack-sized pieces. TIP: The consistency of your mixture may vary depending on the type of peanut butter you use (fresh ground or jarred). If you find your mixture is too sticky, add another sprinkle of oats. If your mixture seems a bit too dry, add another 1-2 tablespoons of peanut butter. If you’re looking for more snack ideas, grab my free Breakfast, Lunch & Dinner Cheat Sheet – there’s a bonus snack section of some of my favorite (mostly healthy) snack ideas to have on hand at work and at home. What’s your favorite snack to have on hand at work?